We all know that Tim Burton loves pancake white makeup, black eyes, spirals and stripes — but those are not the only things he loves to feature over and over again! You'll see the same handful of characters, plot devices, and even facial expressions over and over again, throughout Tim Burton's films. We've rounded up some common Tim Burton tropes and sorted them into categories, for your next drinking game. Here are 10 things that turn up in almost every Tim Burton movie. Never trust a smiling face with a bit of weight in a Burton movie. What better way to explain your character's pain, than with a flashback! Burton loves to dip from the same well all the time. While some actors (Winona Ryder) have appeared in two or three Burton movies, these guys pop up over, and over again. The thing that goes bump in the night. Hardly ever the main character or real menace, these monsters are built to threaten, propel or set boundaries for Burton's cast. But each one is pretty spectacular. Someone needs a hug! The Burton world is stuffed with insanely wonderful parent figures. That's not to say all the other parents are bad, but for each absentee father or neurotic artist, there's usually one elderly character ready to pick up the pieces and tuck you into a soft waterbed. Whether misunderstood or just no good, Burton loves to throw in a sassy witch to stir the pot. Each one of these ladies is an intimidating creature on their own. With great powers that they use to get what they want. Horrific, bug-eyed scare jumps that make the audience jump out of their chairs. You never actually get to see Michael Keaton's "nightmare face" in Beetlejuice, but there are plenty more to pick from in that movie. The horrific Smilex transformation in Batman, which is also the name of the toothpaste company Charlie's father works for in Charlie and the Chocolate Factory! The misunderstood ladies trapped in a world of their own. These rebels are often the voice of reason in Burton's mad, mad world. The other side of the lady coin in Burton's world. 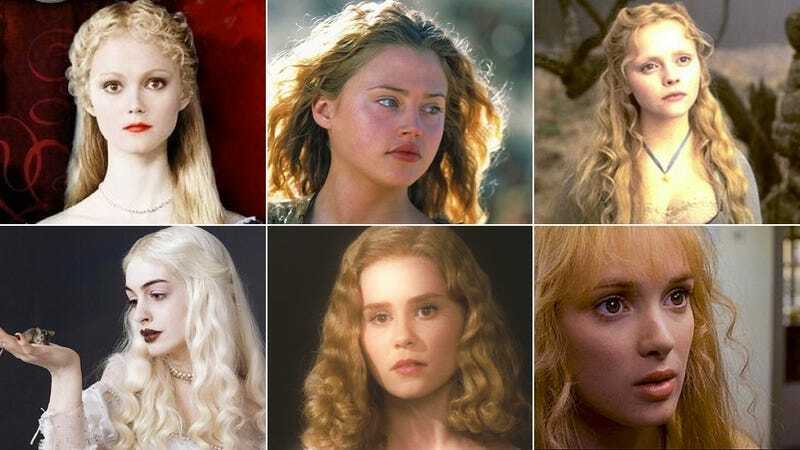 This director's obsession with the innocent, blonde ingenue is so strong he's be-wigged countless brunettes to get that perfect bleached from all sins look. In fact Dark Shadows might be the first Burton movie where the innocent love interest isn't blonde (Corpse Bride doesn't count, since Victoria's hair was some sort of light grey). Burton has built his entire career on the twitchy outcast.